It was an ordinary day on Ward Four at Grantham Hospital. Everything was calm, and the nurses were giving the children their tea when suddenly there was a crisis. A seven-week-old boy had stopped breathing. His parents ran to his side, nurses and doctors came to his aid, all of them thinking that there must be some innocent cause, all of them guessing that there was an easy solution, none of them guessing that they were witnessing the beginning of one of the most horrifying stories in the history of crime…. We take it for granted that a hospital is a safe place. We trust nurses with our lives. 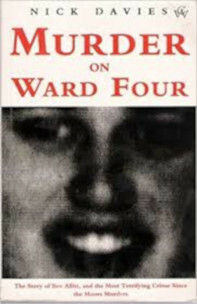 Murder On Ward Four traces the accelerating crisis in a hospital that became a killing ground: the series of unexplained deaths; the distraught families; the helpless staff; the detective and his hunt; the scandal as the truth dawned; the political panic that followed; and the eerie mind of the murderer with the very curious past. Written with the exclusive co-operation of key characters in the story, Murder on Ward Four is the definitive account of a crime and also a penetrating analysis of the weaknesses running through the National Health Service on which millions rely for their well-being. First published by Chatto & Windus (Random House, UK) in 1993.